Hits for a max ~3,500; flurries. This page last modified 2012-03-14 15:21:03. Ok, after having JUST fought this guy, I'm very much persuaded that you've got the WRONG rusty bite associated with this guy. It must be cured, or else you'll be dealing with 8k more damage a tick from this guy. Also, it should be noted that rusty's max hit is 3461, and he flurries. If you combine his normal damage output with his 8k DoT, he can spike up to nearly 4k DPS (rolling 6 second DPS) and can do close to 10k damage in a single shot (a good round + his 8k DoT). This guy is nasty, but the good news is that the DoT is resistable and curable with disease. 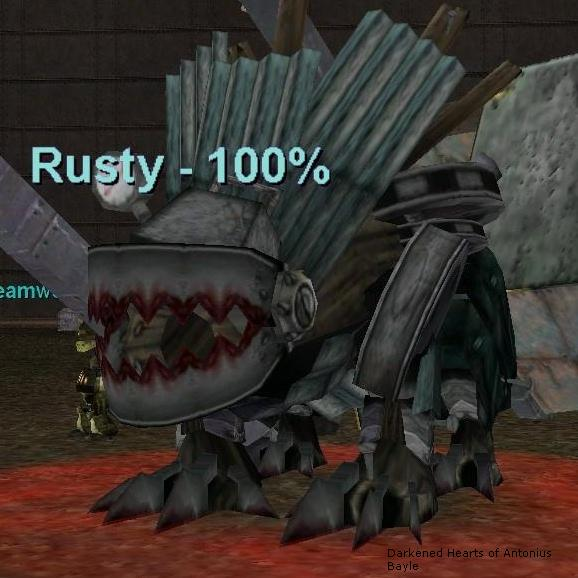 Rusty spawns in the NW pit area. He spawned for us off of a roaming mob in the middle of the pit. He will wander back over to the trap area in the back corner if left to roam. Don't know if this was changed, but his DD (Rusty Bite) is definitely resistable. My war was resisting it more often than not with resists around 500. [Thu Feb 14 00:23:32 2008] You resist the Rusty Bite spell! anyone have a spawn loc for this guy ? Rusty seems to have 2 or 3 PH's. Paste this into your map files for FM. THis location is the static spawn location, i have also seen him spawn in place of the wonderers just to the south of this loaction. Kill the mob in this loaction and the 3 or 4 wonderers and you will get your mob.